Specialising in soil, crop, pasture and livestock nutrition. Treating mineral deficiencies at their source. Debenham Australia`s origins began back in the early 1960’s with David Debenham advising clients in the beef, sheep and dairy sectors on soil, plant and animal nutrition . Since then his sons, Andrew and Ian have taken over and expanded the business to a broad national client base. Their combined expertise has enabled Debenham Australia to be recognised as a leading supplier of quality products backed by reliable science within the Australian rural sector. Our advice is unbiased, relevant, practical and science-based. In determining what product is appropriate, we assess factors including all aspects of animal production, including health, as well as soil and plant nutrient status. The assessment process could be simple or may require regular farm visits involving ration formulation, feed and fodder budgeting, feed testing, soil testing inclusive of fertilizer recommendations and plant tissue testing. 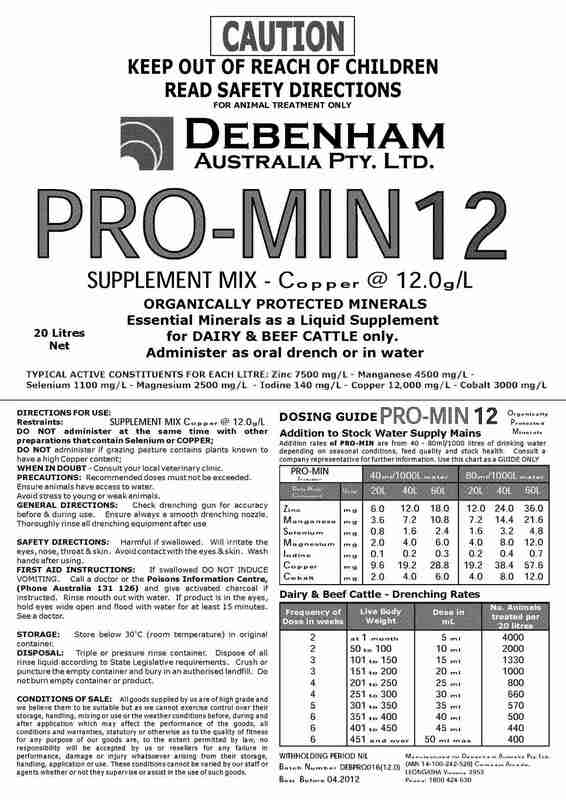 Debenham Australia have products to be included in dairy rations or applied to the soil and pasture. Our leading product range of NUTRIFEED dairy additives can be supplied into animal feed. TECH-FLO high quality foliar nutrients, applied to the pasture, overcome trace mineral deficiencies for livestock. Debenham Australia also supplies limes and gypsum where required from approved suppliers. Clients can be assured that all of our products and solutions are aimed at improving profitability and sustainability and we maintain the highest possible quality assurance systems and accreditation in the manufacturing and distribution processes. We appreciate that the individuality of each farm requires a specific feeding and management strategy. Our business is to determine the requirements of each farm and to produce and develop solutions suited to that situation and the farmer’s objectives. The company provides technical advice and products into the dairy and grazing sectors to achieve this. 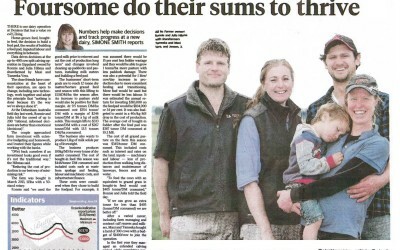 Our success is recognising where the farmer will get the best return for dollars spent. As long term industry professionals we have a solid understanding of the requirements of soils, plants and animals and the requirements of the client. We will identify your requirements and recommend the highest quality product in the most cost effective manner. Animal nutrition focuses on the dietary needs of agricultural animals that drive the profitability of each farm business. The skill set within the business of Debenham Australia enables clients to obtain information, products and recommendations for a wide range of aspects of their business. On aspects where Debenham Australia is unable to assist, a third party recommendation can be given. This is all directed towards one goal: by achieving the best results for our customer’s business – we ensure the success of our customers. 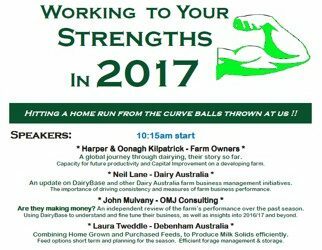 On-farm consulting on dairy and mixed farming operations (dairy, beef & sheep). Establishing the right feed strategy and a nutrient requirements. Nutrition, management, health, welfare and integration of livestock into mixed farming and cropping operations. Providing accessible knowledge and experience about all aspects animal nutrition. Our sales nutrition team cover all regions of Victoria. In addition we work with leading nutrition consultants in the dairy regions of NSW. At Debenham Australia we understand animal nutrition and health play a major role in the performance of your farming enterprise. Livestock well-being impacts directly on profitability therefore product choices are hugely important. We understand that our customers are continually looking for the best performance while keeping their costs under control. That’s why we work closely with our customers to identify the right solution for their livestock at any particular time. We know animal nutrition and we are committed to producing top quality products that deliver outstanding performance and value. The NUTRIFEED dairy range of rumen modifier/mineral/vitamin additive pellets for high producing cows. Nutrifeed is manufactured under full FIAAA, industry feed safe, HACCP and other industry accreditation including ISO 9001 and APVMA accreditation. There is a growing awareness that the analysis level of a rumen modifier /mineral/vitamin additive is only part of the story that determines the amount of mineral/vitamin or modifier that is absorbed into the animal’s system. ln determining what is the most suitable additive mix for the herd, the analysis level, solubility, balance and the absorption rate in to the blood stream are all important factors. ln addition the physical characteristics of all ingredients to ensure mixing consistency and the assay and factor levels of the rumen modifiers are also important to ensure the additive consistently meets the targeted outcome. 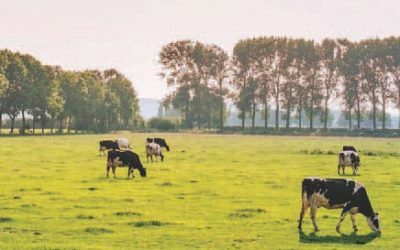 The ingredients selected for use in the additive range are of the highest quality to assist the high producing dairy cow to develop it’s genetic potential in a predominantly pasture fed system. 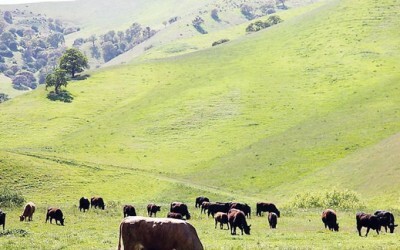 The Tech-Flo & Nutrifol ranges of foliar nutrients are used in the beef and sheep industries to overcome trace mineral deficiencies in livestock. TECH-FLO high performance micronized foliar nutrients to overcome trace mineral deficiencies in livestock. High analysis including an efficient delivery system for penetration into the plant. Micronized flowable formulation enabling low application rates (min15litres/ha). Low phytotoxicity risk because of pH neutral formulation. Highly compatible with most commonly used herbicides and insecticides (consult your local representative). Application through boomsprays, misters or aircraft. Download the TECH-FLO Trial Brochure for full product details. Download the TECH-FLO Product Range. NUTRIFOL Liquid and powdered foliar nutrients to overcome trace mineral deficiencies in livestock & pastures. PROMIN liquid minerals supplied as a supplement into stock water or as an oral drench. ALL WEATHER STOCKLICK – a loose lick supplying macro and micronutrients and vitamins to all livestock. LIMES & GYPSUM – to correct soil pH, improve soil structure and balance calcium and magnesium in the soil. For dairy, beef and sheep. DEBENHAM Australia Pty Ltd has announced the introduction of Calciprill into Gippsland. Debenham Australia ® is a Registered Trademark owned by Debenham Australia Pty Ltd.